You are here: Home / Basketball / Can Lone Ranger Westbrook Survive in the Wild Western Conference? To be honest, I haven’t always been a big fan of Russell Westbrook. When he first came into the league I found his self-focused attitude distasteful and counter-productive to teamwork. In fact, if I were to describe my sentiment toward him today it still wouldn’t be that of “fan”. However, I have tremendous respect for the player he has become. This season, Westbrook is out for blood, but how long can he keep up this heroic effort? I truly believe Westbrook and the Thunder can remain successful through the season, but there are some key things that need to take place along the way for that to happen. Let me elaborate. By now, all the drama surrounding the Kevin Durant’s free agency move is old news and over the past few months Westbrook has been very open about his disapproval of Durant’s decision to abandon the Thunder. It’s clear that Westbrook has a pretty big chip on his shoulder entering the 2016-2017 season while remaining committed to winning with OKC at all costs. The Thunder opened the season with a bang–recording four wins in a row before losing their fifth game to the Golden State Warriors. Accordingly, Westbrook has been all business tallying huge numbers in the first five games. The effort from this 6 foot 3 guard from Long Beach has been nothing short of incredible. Everyone has been amazed at how the Thunder came out on the war path but keep in mind that they’re only five games in. The real question is can this team maintain a culture of winning and if so, how? Steven Covey is famously quoted as saying, “The main thing, is to keep the main thing the main thing.” While this may sound foolishly simple, it’s actually quite brilliant. Part of the reason the San Antonio Spurs have had so much success under Coach Gregg Popovich is because Pop has a knack for getting his players into the right roles. Westbrook’s jaw-dropping performances this season are great but in order to keep winning he needs to focus on his role and let his teammates step up to play theirs. Westbrook is averaging 34 points per game, 9.6 rebounds and 10 assists. Incredible individual stats, but a true leader makes others around them better. As such, Westbrook will need to learn to rely upon teammates Victor Oladipo & Enes Kanter to assist him in scoring, among others. Let’s also not forget that burly New Zealander Steven Adams plays for this team. Westbrook is bringing in more rebounds than one of the best centers in the league (in my opinion). He needs to trust Adams to get under the rim and bang on the boards because that is what Adams was born to do. Westbrook can lead the charge, but he needs to learn to trust his team lest he turn into another one man show on a losing team like Carmelo Anthony or Anthony Davis. 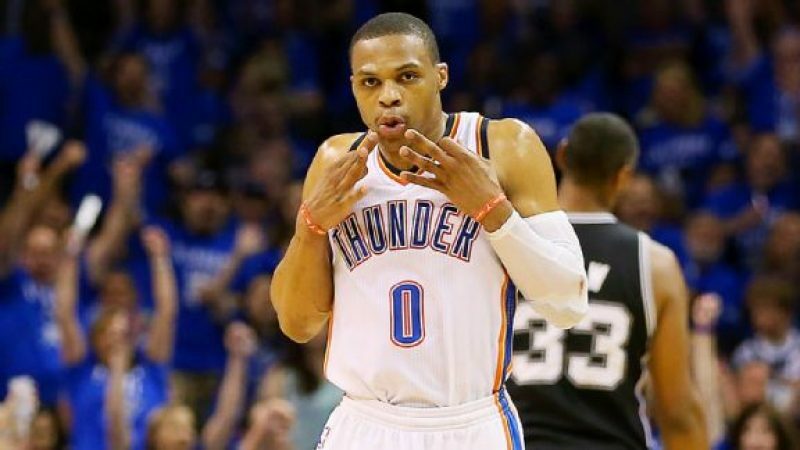 Let’s face it—Westbrook will not be winning any awards for Mr. Congeniality any time soon. It’s evident that he keeps to himself and prefers to bear team burdens on his own. However, it’s also evident that he has a vision for where he wants to take OKC. As the team leader, Westbrook needs to take some time with his teammates to share his vision with them and what role they play in that vision. Only then will his teammates buy in and join together to pursue the common goal. If each player on the Oklahoma City Thunder is headed toward the same target while knowing the role they play in getting to that target, magic will happen. This is what takes teams from good to great. Lastly, the Oklahoma City Thunder coaching staff and front office need to focus on building a team around Russell Westbrook. Coach Billy Donovan has proven himself to be an excellent leader, but now he needs to determine how he can make each player most efficient in their respective roles. It’s clear that Westbrook is the alpha player the offense can center around, but what are his weaknesses? Being that he’s only 6 foot 3 he’s going to need some bigs to help him defend, and some support on the scoring end so he can facilitate the offense the way he needs to. The OKC roster boasts incredible talent, but they need some development before they’re ready to adequately support Westbrook’s level of play. To get there, Coach Donovan will need to spend some time getting to know each of his players closely so that he can strategize his lineups most effectively and further develop players where needed. Westbrook is OKC’s main man so everything must center on clearing his plate of anything that takes his focus off what he’s best at. Last night’s loss to the Warriors was no doubt a huge blow to OKC’s ego, but they welcome Golden State onto their home court on February 11th, 2017 so they have plenty of time to improve. I truly want to see this team go far this season to prove the nay-sayers wrong. Curious…do you think @russwest44 can keep up this torrid pace all season for the @okcthunder ?